Now may the God of peace himself sanctify you completely, and my your whole spirit and soul and body be kept blameless at the coming of our Lord Jesus Christ. He who calls you is faithful; he will surely do it (vv. 23-24). Our hope is based on God’s word (i.e., his promises). How can we be sure that Christ really will return one day? How can we be sure that God won’t let us down? The apostle Paul’s answer: because God is “faithful” (v. 24). He’s reliable. “God is completely trustworthy, not only ‘worthy’ of our ‘trust,’ but absolutely to be relied on to carry out what has been promised.”  Our hope would be uncertain if God was not faithful. In the beginning of the book of Exodus, the Israelites are slaves in Egypt. “And God heard their groaning, and God remembered his covenant with Abraham, with Isaac, and with Jacob” (Exod. 2:24). God chose Moses to lead the Israelites out of Egypt, and God revealed to Moses that his name is Yahweh (Exod. 3:14). God said to him, “This is my name forever, and thus I am to be remembered throughout all generations” (Exod. 3:15). The name Yahweh reminds us that God keeps his promises. After God had rescued the Israelites, Moses proclaimed to the people, “The LORD you God is God, the faithful God who keeps covenant and steadfast love with those who love him and keep his commandments, to a thousand generations” (Deut. 7:9). God’s name is still Yahweh, and he is still a covenant-keeping God. Verse 23 is a prayer. The prayer has two parts: (1) “may the God of peace sanctify you completely”; (2) “may your whole spirit and soul and body be kept blameless at the coming of our Lord Jesus Christ.”  This is a prayer about holiness. What does Paul say God will do (“he will surely do it,” v. 24)? God will make sure that we (i.e., those of us who have put our faith in Christ) will stand “blameless” (v. 23) at the final judgment (“at the coming of our Lord Jesus Christ”). Escaping condemnation is not the result of our own effort. It depends on the faithfulness of God. Paul wrote to the Philippians, “I am sure of this, that he who began a good work in you will bring it to completion at the day of Jesus Christ [i.e., his return]” (Phil. 1:6). However, striving for holiness is expected of every Christian and provides evidence of the Holy Spirit’s presence within us. The other day my bathroom tap wouldn't turn off. The cartridge inside was broken. It was less than two years old. That's frustrating. Unlike the people and things of this world, God is one hundred percent reliable. With God, there should never be a doubt that he will do what he has promised to do. Gordon D. Fee, The First and Second Letters to the Thessalonians, 231. This prayer is similar to the one found in 3:13. All of us have good and bad habits. In 1 Thessalonians 4:16-18, the apostle Paul tells the Thessalonians that they must develop the habit of worship. Paul not only tells us what we should do, but also how often we should do it. How often are we to rejoice? “Always.” How often are we to pray? “Without ceasing.” How often are we to give thanks? “In all circumstances.” Rejoicing, praying, and giving thanks are to be habits in our lives. Obviously it’s impossible to always being doing these things. You can’t pray while you’re sleeping! The point is that we are to develop the habit of worship. When is it most difficult to rejoice? When life is difficult. The Thessalonians were facing adversity (“these afflictions,” 3:3). How can we rejoice when life is difficult? Paul writes in Philippians 4:4, “Rejoice in the Lord always.” We can always rejoice “in the Lord”—in who he is and what he has done, is doing, and will do. “This is not a sugar-coated call for putting on a happy face in the midst of difficulties.”  “We aren’t called to bury our feelings.”  Paul never told the Thessalonians not to grieve (see 4:13; cf. Rom. 12:15; 1 Peter 1:6). The author of Psalm 42 admitted to feeling “cast down” (i.e., depressed). He writes, “Why are you cast down, O my soul, and why are you in turmoil within me? Hope in God; for I shall again praise him, my salvation and my God” (Psalm 42:5-6). What can we do if our lives are difficult? “Rejoice in hope” (Rom. 12:12). In order to develop the habit of prayer, we must believe three things. First, we must believe that prayer really works. If God loves us, he would not tell us to do something that would be a waste of time. Second, we must believe that when we pray, we are communicating with a loving Father. We know he loves us because he “did not spare his own Son but gave him up for us all” (Rom. 8:32). If an imperfect father “know[s] how to give good gifts to [his] children, how much more will [our] heavenly Father who is in heaven give good things to those who ask him!” (Matt. 7:11). Third, we must believe that we need God. It’s in the good times that we most neglect prayer. We might think we’re doing fine on our own without God. Prayer demonstrates our dependence on our heavenly Father. Should we give thanks for all circumstances? We should be thankful in all circumstances, knowing that God can do something good in every circumstance (see Rom. 8:28). The ultimate example of this is the cross. Aristotle said, “We are what we repeatedly do. Excellence then, is not an act, but a habit.” Developing the habit of worship usually doesn’t happen overnight. How can we develop the habit of worship? We must learn to focus on God and his salvation. What are some things you can do to make sure you think about God and his salvation every day? To “exhort” means to urge someone to do something. Gordon D. Fee, The First and Second Letters to the Thessalonians, 214-215. Gary S. Shogren, 1 & 2 Thessalonians, 224. For you yourselves are fully aware that the day of the Lord will come like a thief in the night (v. 2). One day when I was about ten years old, my grandparents traveled from Vermont to New Brunswick to visit us. They were going to arrive late at night, so my dad decided to leave the garage door open for them. The next day I discovered that my bike was gone. Apparently a thief in the night and walked through the open garage door and stolen my bike. “Stay awake, for you do not now on what day your Lord is coming. But know this, that if the master of the house had known in what part of the night the thief was coming, he would have stayed awake and would not have let his house be broken into. Therefore you also must be ready, for the Son of Man is coming at an hour you do not expect” (Matt. 24:42-44; cf. 2 Peter 3:10; Rev. 16:15). When Jesus returns, most of the world will not be expecting him. He will come “like a thief in the night” (v. 2). The apostle Paul writes, “But concerning that day and hour [i.e., the day and hour when Jesus will return] no one knows, not even the angels of heaven, nor the Son, but the Father only” (v. 1). Jesus himself said, “Concerning that day or that hour, no one knows” (Mark 13:32). None of us knows when Jesus will return. If someone gives a date for the return of Jesus, ignore that person. He or she doesn’t know when it will happen. The apostle Peter also writes that the coming of Jesus will be “like a thief in the night” (2 Peter 3:10). He states that “scoffers will come in the last days scoffing.” They will ask, “Where is the promise of his coming?” (2 Peter 3:3-4). The promise was given 2,000 years ago, but Peter goes on to say, “Do not overlook this one fact, beloved, that with the Lord one day is as a thousand years, and a thousand years as one day” (2 Peter 3:8). So why has Jesus returned yet? Here’s Peter’s answer: “The Lord is not slow to fulfill his promise as some count slowness, but is patient toward you, not wishing that any should perish, but that all should reach repentance” (2 Peter 3:9). Could Jesus return today? Maybe. It’s possible. No one knows whether Jesus will return today, tomorrow, or a thousand years from now. But we should live each day thinking that today could be the day of the Lord’s return. What is “the day of the Lord” (v. 2)? The day of the Lord is “that eschatological event when the Lord comes to judge the inhabitants of the earth and to pour out his wrath because of sin.”  “Blow a trumpet in Zion; sound an alarm on my holy mountain! Let all the inhabitants of the land tremble, for the day of the LORD is coming; it is near” (Joel 2:1). For those not expecting the return of Jesus, the day of the Lord will “come like a thief in the night” (v. 2). It will be an unwelcome surprise. “While people are saying, ‘There is peace and safety,’  then sudden destruction will come upon them as labor pains come upon a pregnant woman, and they will not escape” (v. 3). For the Christian, the day of the Lord is not a day to be feared. “God has not destined us for wrath, but to obtain salvation through our Lord Jesus Christ, who died for us so that whether we are awake or asleep we might live with him” (vv. 9-10). For the Christians, the day of the Lord is a day of salvation, not a day of judgment. Paul ends this section by writing, “Therefore encourage one another and build one another up, just as you are doing” (v. 11). Paul writes, “But you are not in darkness, brothers, for that day to surprise you like a thief. For you are all children of light, children of the day. We are not of the night or of the darkness. So then let us not sleep, as others do, but let us keep awake and be sober” (vv. 4-6). To “sleep” is to live without expecting the Lord’s return. One of the Christian’s greatest enemies is complacency. If you examine Paul’s letters, you’ll discover that he never promotes complacent Christianity. He always encourages his readers to keep on progressing, to keep on striving to become more like Jesus. Paul goes on to day, “But since we belong to the day, let us be sober, having put on the breastplate of faith and love, and for a helmet the hope of salvation” (v. 8). This is an allusion to Isaiah 59:17: “He put on righteousness as a breastplate and a helmet of salvation on his head.” The image is one of Jesus coming as a warrior. Our first concern should not be when Jesus will return but how we should live until he returns. If we lived each day as though it could be the day of the Lord’s return, we would overcome our complacency. G. L. Green, The Letters to the Thessalonians, 232. Green comments, “With the establishment of the pax Romana under Augustus, peace and safety became the byword in the city as throughout the empire, and so the apocalyptic teaching of the apostles would have sounded decidedly strange” (233). But we do not want you to be uninformed, brothers, about those who are asleep, that you may not grieve as others do who have no hope (1 Thess. 4:13). 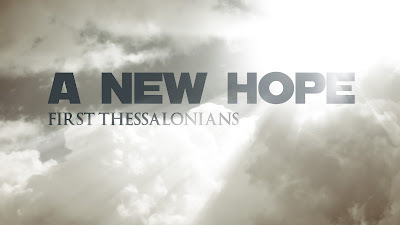 The return of Jesus is mentioned in every chapter of 1 Thessalonians (1:10; 2:19; 3:13; 4:13-18; 5:1-11, 23). The promise of the Lord’s return is what gives us hope. The command to love others is disobeyed when we make a particular view of eschatology a test of orthodoxy. You might be wondering what my view is on “the coming of the Lord” (v. 15). My view is the posttribulational view (i.e., there is no rapture of the church before the tribulation period). But what about the promise of 1 Thessalonians 1:10: “wait for his Son from heaven, whom he raised from the dead, Jesus who delivers us from the wrath to come” (cf. 2:16). God’s wrath and tribulation are not the same thing. The church will suffer man’s wrath but not God’s wrath (like how the Israelites were afflicted by the Egyptians but were spared from the ten plagues). The apostle Peter wrote, “Beloved, do not be surprised at the fiery trial when it comes upon you to test you, as though something strange were happening to you. But rejoice insofar as you share Christ’s suffering, that you may also rejoice and be glad when his glory is revealed [i.e., when Jesus returns]” (1 Peter 4:12-13). Paul wants to inform the Thessalonians about the fate of the dead in Christ so “that [they] may not grieve as others do who have no hope” (v. 13). Our hope is the Lord’s return. It’s a hope that’s based on the resurrection of Jesus: “For since we believe that Jesus died and rose again, even so, through Jesus, God will bring with him those who have fallen asleep” (v. 14). It’s called “our blessed hope” in Titus 2:13: “Waiting for our blessed hope, the appearing of the glory of our great God and Savior Jesus Christ.” It’s our “one hope” (Eph. 4:4). It should unite us! Paul concludes this passage with these words: “Therefore encourage one another with these words” (v. 18). One of the reasons why we gather together as a church is to encourage one another. We are not to be “neglecting to meet together, as is the habit of some, but encouraging one another, and all the more as you see the Day drawing near” (Heb. 10:24-25). We shouldn’t allow our views on the timing of the Lord’s coming to divide us. Instead, we should talk about our hope and encourage one another! This quote is found in George E. Ladd’s The Blessed Hope (59). The Greek word translated “afflictions” (thlipsis) is the same word translated “tribulation” in Matthew 24:21. Gordon D. Fee, The First and Second Letters to the Thessalonians, 175.